This year, the ceremony for awarding the “July 26” Awards took place on March 14, 2017. 6 UKIM students received these traditional awards: Andrijana Ruseska from the Blaze Koneski Faculty of Philology (10,00), Marija Davcheva from the Faculty of Philosophy (10,00), Vlatko Tokarev from the Iustinianus Primus Faculty of Law (9,90), Trajche Filipovski from the Faculty of Economics (9,87), Marko Dzambazovski from the Faculty of Dramatic Arts (9,52) and Esra Iljazi from the Faculty of Architecture (9,22). Professor Nikola Jankulovski, rector of the Ss. 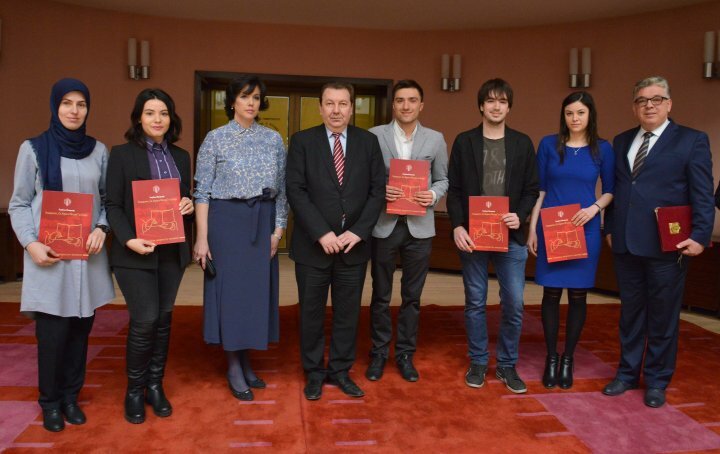 Cyril and Methodius University handed the awards to these 6 UKIM best students that received these awards according to the current criteria of the Marr-Munning trust.